Workforce development – a relatively wide range of activities, policies, and programs to prepare clients for the workforce like youth vocational training, adult training and retraining, and other related employment and apprenticeship initiatives. Racial equity – the systematic fair treatment of people of all races that results in equitable opportunities and outcomes for everyone. This month, President Trump signed an executive order to expand apprenticeships nationwide that would prioritize decentralized government and privatization of the public workforce system. This move signals an attempt to restructure and defund workforce initiatives like the WIOA (signed into law by President Obama in 2014), which currently stipulates work opportunities for formerly incarcerated individuals. Unlike previous policies, the WIOA also tracks racial demographics to account for barriers to employment by race. 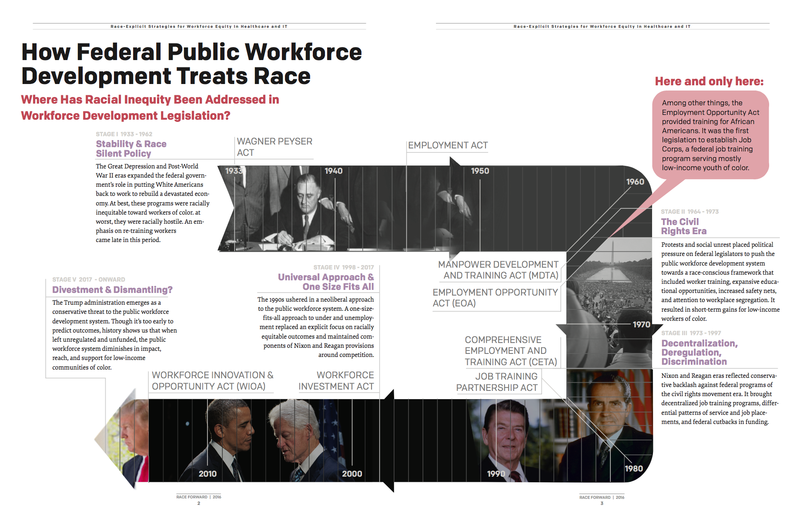 White House surrogates have been promoting President Trump’s order that appears in lockstep with Nixon and Reagan era policies characterized by decentralization, deregulation, and discrimination (see infographic below). During an interview on Fox News, Kellyanne Conway stumbled over her words while explaining workforce development and highlighting the need for technical skills education. Ivanka Trump was also hard a work tweeting, “Closing the skills gap is critical for increasing labor-force participation. #WorkforceWeek”. Not surprisingly absent from the White House’s talking points on improving the labor force is a race-explicit strategy that addresses barriers low-income workers of color confront while navigating the public workforce system. I had the privilege of co-authoring Race Forward’s latest research report Race-Explicit Strategies for Workforce Equity in Healthcare and IT that argues ‘closing the skills gap’ is not enough to ensure equitable outcomes for low-income workers of color who, regardless of the skills they acquire, still face barriers in achieving sustainable income and advancing in the workforce. For formerly incarcerated individuals, these barriers are most salient. According to the National Employment Law Project, between 60-70% of the formerly incarcerated remain unemployed up to a year after their release. Background checks present a major problem finding employment particular in retail and caregiving, industries where formerly incarcerated women are most concentrated. Further studies indicate that prison time lowers wages up to 20%. Race Forward’s research team and I spent a year talking with key experts, practitioners, and clients in workforce development to identify barriers to achieving equitable employment outcomes for workers of color in healthcare and information technology (IT) careers, two of the fastest growing sectors in the United States. Our analysis includes results from an online survey of 70 workforce development organizations, primarily community-based organizations (CBOs) and One-Stop Centers (agencies that provide comprehensive employment-related services). To get a better sense for how workforce development agencies support reentry, we asked practitioners about opportunities they provide to formerly incarcerated clients preparing for the workforce. Findings from the survey indicate that when it comes to general support services that impact workers of color, such as providing placement programs to formerly incarcerated individuals and specialty training for employers on race and color discrimination, less than half of respondents from CBOs said they provide these services. One-Stop Centers also fall short when it comes to providing training programs for employers on race and color discrimination. However, more than half of respondents from One-Stop Centers said they provide placement programs for formerly incarcerated workers. From Race Forward’s Report: Race-Explicit Strategies for Workforce Equity in Healthcare and IT (May, 2017). It’s worth noting here that One-Stop Centers receive federal funds that community-based organizations unaffiliated with One-Stop Centers do not receive. This presents a problem for formerly incarcerated individuals that depend on community-based organizations for support. It is unclear from the recent executive order how the Trump administration will, if at all, stipulate federal funding specific to reentry employment opportunity programs. What we do know is that thirty-eight percent of African Americans and 34% of Hispanics make up the formerly incarcerated population in the United States. Given that large populations of clients enrolled in workforce development programs are also racially marginalized, the response from institutions on racial equity becomes a critical issue of our time. My work as a CPP fellow at Teachers College has provided me with an opportunity to understand more intimately how reentry and workforce development intersect. Throughout this year, the CPP team will be working with adult and youth participants involved in reentry and alternatives-to-detention programs to explore well-being, and most importantly, examine ways communities can better support these individuals when institutions fail. In an era of social unrest and precarious policies, it is perhaps more crucial than in recent years to interrogate reentry experiences. Indeed, the relationship between race, labor, and incarceration has been examined many times over. Our work here at CPP is concerned with well being as an aspect of the reentry that has been least examined to address the systemic fair treatment of formerly incarcerated individuals. As educational researchers, the experience of belonging matters to us; namely how this basic human need manifests for those navigating institutions, stepping back into communities, and rebuilding relationships. We believe it is in the muck of these dynamics where we’ll find a silver lining. Tara L. Conley, Ed.D. is a postdoctoral fellow at the Civic Participation Project at Teachers College, Columbia University and Senior Research Associate at Race Forward: The Center for Racial Justice Innovation.